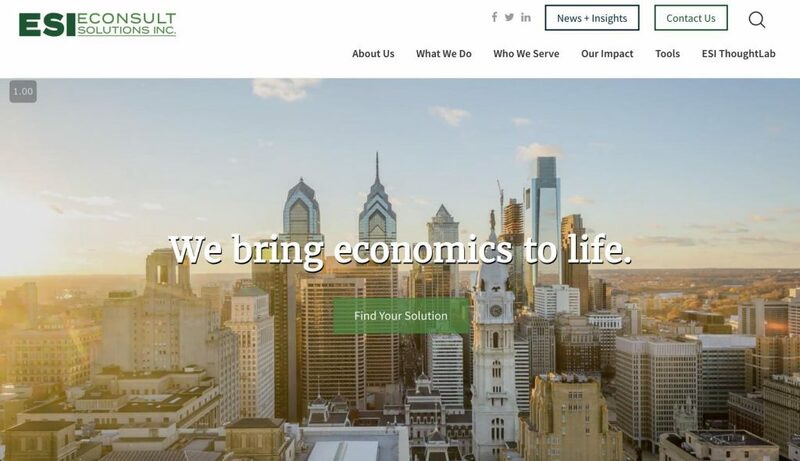 Econsult Solutions, Inc. is an innovative economics practice that helps answer clients’ big questions and tell their stories through insights, ideas, and thoughtful analysis. They serve governments, non-profits, institutions, and businesses, using their expertise to improve the urban environments where we work and live. They approached me in need of a website that better integrated the high-quality content hidden on their site. They also needed a more cohesive narrative to bring together the many types of services they provide for different industries. I worked with their marketing team, five partners, and various stakeholders from a joint venture to create a site that spoke cohesively to their diverse audiences. Econsult Solutions publishes new reports, analysis, and blog posts multiple times a week, but their previous website stored all of this content on separate blog and report feeds, buried in sub-menus. 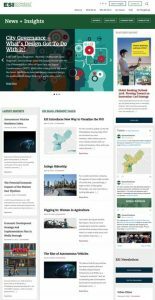 We added a section to the home page to prominently display a curated list of their latest content, as well as building an integrated news portal page. This page pulls content from all of their feeds and displays it like a news website. This targets anybody with an interest in urban revitalization and is designed to elevate their voice in these circles. Econsult Solutions serves many target audiences with diverse needs, so we needed to find a way to quickly connect users to the relevant services and experts without being overwhelmed. We designed an area on the home page to funnel them by industry. These “Solution” pages could be hyper-targeted to that industry’s specific needs, including featuring staff who work in that area as well as reports and other content related to the industry. On the previous site, users might find an engaging piece on information, read it, then leave. There was no system for highlighting Econsult’s other relevant work. Losing all of these engaged users was a huge missed opportunity. This time around, we made sure users would never reach a dead end. At the bottom of every article or report, there is a list of related content. This content is generated automatically based on keywords and categories included with each post. The larger a site is, the more important smart architecture and logical connections are to the user experience. We built the site to seamlessly connect the many different content types, so users could access a huge library of information without feeling like they were on a huge, intimidating site. Integration isn’t just a one-time build. It’s only valuable if every new piece of content added after launch can seamlessly connect with the larger eco-system. Since launch, Econsult Solutions has done a wonderful job managing and curating their content.